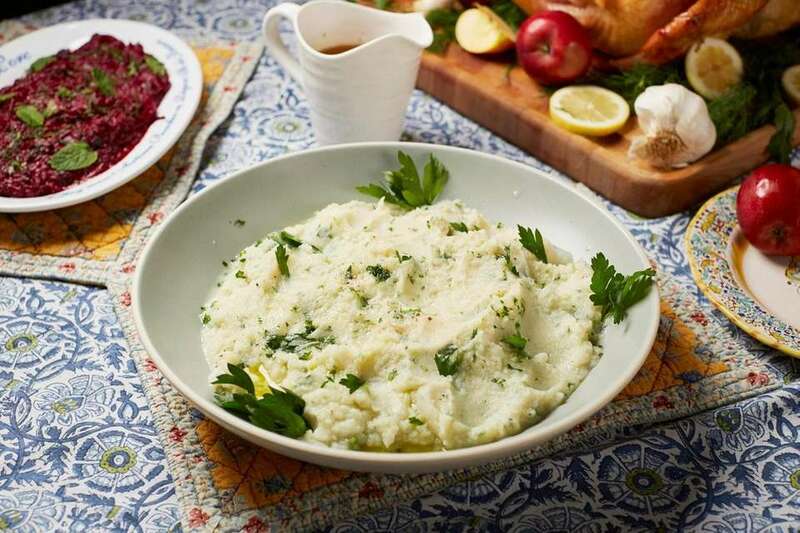 From seasoned vegetables to creamy potatoes, these delicious sides will go great with your Thanksgiving turkey. 1. Bring a large pot of salted water to boil, add the cauliflower florets and cook until they are fork tender, about 15 to 20 minutes. 2. Drain and transfer to the bowl of a food processor and pulse until smooth. (You may need to do this in batches depending on the size of your food processor.) Reserve (this is can be done a day in advance). 3. When ready to serve, melt the half stick of butter in a large saute pan, mix in the cauliflower and add the salt and pepper. When cauliflower is heated through, add the parsley and lemon juice. Taste and adjust seasonings if needed. Transfer to a bowl, top with remaining tablespoon of butter and serve. Makes 6 to 8 servings. 1. Remove zest from 2 or 3 clementines with a zester or vegetable peeler. If you use a peeler, cut zest into a fine julienne, reserving some for garnish. Juice all clementines (you'll have about a cup). 2. Combine zest and juice with remaining ingredients in medium saucepan and bring to boil. Turn heat to medium; simmer until cranberries burst and apples soften, 20 to 30 minutes. 3. Adjust sugar and salt. Cool, garnish with reserved zest. Makes about 2 cups. 2. In a medium skillet, heat olive oil over medium. Add the leek and sauté until caramelized, about 10 minutes. Season with salt and pepper to taste. Set aside. 3. In the greased baking dish, arrange 1⁄4 of the potatoes in a layer, overlapping each other. Season with salt and pepper. Pour 1⁄4 of the cream over the potatoes and sprinkle with 1⁄4 of the cheese and 1⁄3 of the leeks. Repeat with the remaining potatoes, cream, cheese and leeks, topping the fourth layer of potatoes with just cream and cheese. 4. Bake uncovered for 30 minutes, or until potatoes are easily pierced with a knife. Let stand to set and cool slightly before serving. Makes 8 servings. 1. Preheat oven to 425 degrees. Coat 2 large baking sheet pans with cooking spray. 3. Heat the sesame oil in a saucepan over medium high; add the ginger and garlic and cook, stirring, 1 minute until somewhat softened. Add the sugar, 2⁄3 cup water, lime juice and fish sauce and bring to a boil. 5. 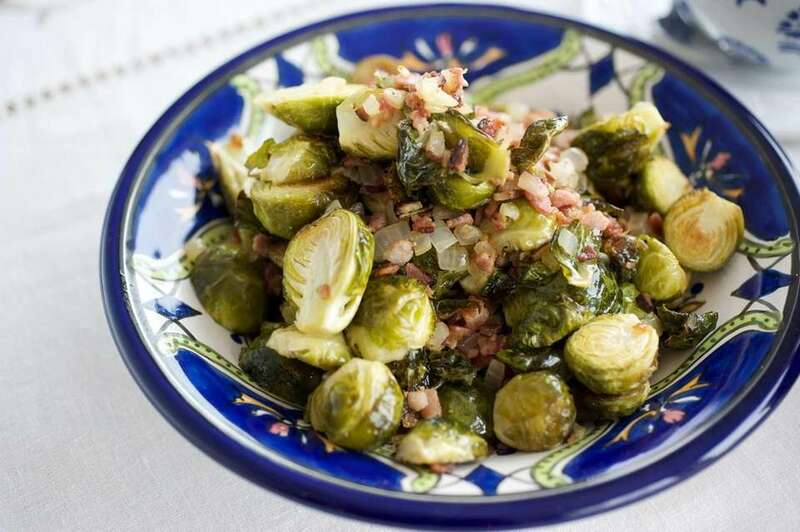 To serve, toss the Brussels sprouts with the sauce and heat in a skillet or microwave. Makes 8 servings. 1. Preheat oven to 425 degrees. Cut the squash in half, remove seeds and slice into 1⁄2 thick semicircles. 2. Toss with salt, pepper and 2 tablespoons of olive oil and spread on a parchment-paper-lined baking sheet. Roast for about 20 minutes, turning once until the squash is caramelized on outside but not too soft. 3. In a saute pan, place remaining olive oil and cook curry leaves until crispy. Remove to a paper towel to drain. Reserve the oil. 4. 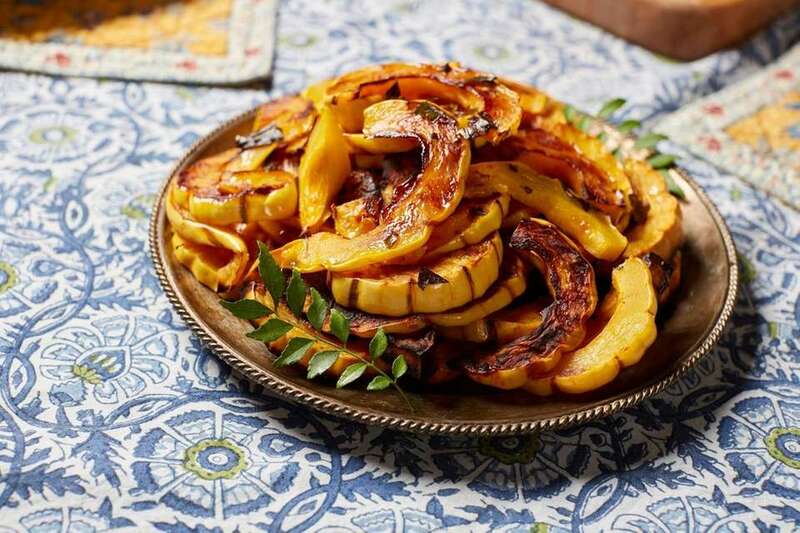 Arrange roasted squash on a platter, drizzle with lemon juice and curry-flavored olive oil in the pan. Gently crush the curry leaves with your hands. Sprinkle leaves and finishing salt on top of squash. Makes 6 to 8 servings. 2. Prick each potato once with a fork, then bake until tender, about 1 hour. When cool enough to handle, peel, cutting away any eyes or dark spots. 3. In a large bowl, mash potatoes with butter, brown sugar, salt, cinnamon, nutmeg, vanilla and maple syrup. Makes 8 servings. 1. In a saucepan, melt the butter over medium heat. Add the carrots and sauté 7 minutes. Add the ginger and cook until fragrant, another minute. 2. Stir in the honey and cook, stirring frequently, until the carrots are tender and caramelized. Season with cayenne, if desired, salt and pepper. Makes 8 servings. 1. Trim the ends off the onions but leave on the skins. Bring a pot of water (make sure it is large enough to hold the onions) to a boil over high heat. Add the onions and blanch for 1 minute and then drain them in a colander under cool running water. Peel the onions and add them back to the pot. 2. With the onions in the pot, add the creme fraiche, heavy cream and poultry stock and bring to a simmer. Continue to simmer until the liquid thickens enough to coat the onions and the onions are tender, about 15 minutes. Season with salt and pepper and add the herbs. If the liquid seems too thick, you can thin it with a little stock or water. Makes 8 servings. 1. Preheat the oven to 450 degrees. Position a rack on the bottom third of the oven. Place a 6-cup popover tin or a 12-cup muffin tin on the rack. 2. Combine the eggs, milk and salt in a blender. Add the flour and blend until smooth. Add the butter and blend until frothy. 3. Remove the pan from the oven and spray the cups and the spaces between the cups with cooking spray. Pour the batter into the cups, filling them about 3⁄4 full. 4. 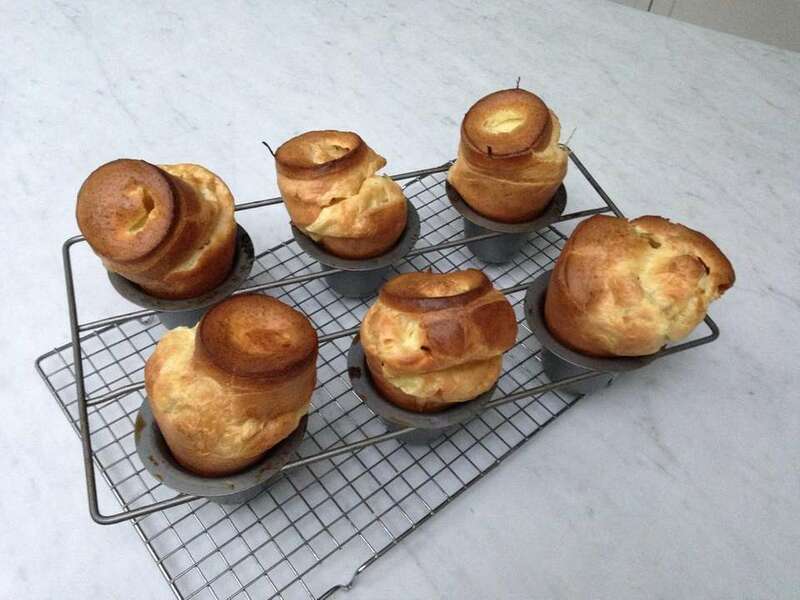 Bake the popovers for 15 minutes. Reduce the heat to 325, and bake until deep golden brown, about 15 to 20 minutes, depending on cup size. 5. Remove the pan from the oven. Insert the tip of a sharp paring knife into the middle of each popover to release steam and overturn onto a wire rack. Serve immediately. Makes 6 large or 12 small popovers. 1. In a medium pot, combine the sweet potatoes and vegetable stock. Bring to a boil and cook until soft, 30 to 40 minutes. Remove from heat and mash potatoes into the cooking liquid. 2. In a large saucepan, melt the butter over medium-high heat. Add the shallots and sauté for 4 minutes. Add the curry powder, cumin and coriander and sauté until fragrant, 2 to 3 minutes. Add the vinegar and cook, stirring, to deglaze the pan. Reduce by half. 3. 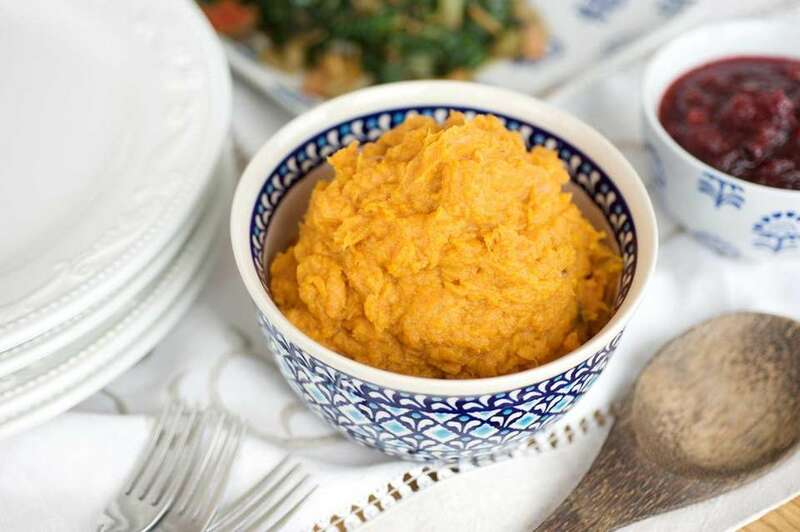 Add sweet potato puree with liquid into the saucepan. Bring to a boil, then reduce heat. Simmer 15 minutes to let flavors meld. Add cream and simmer another 10 minutes. Season with salt and pepper to taste. Push soup through a fine strainer and into another pot. Cover and keep warm. 4. 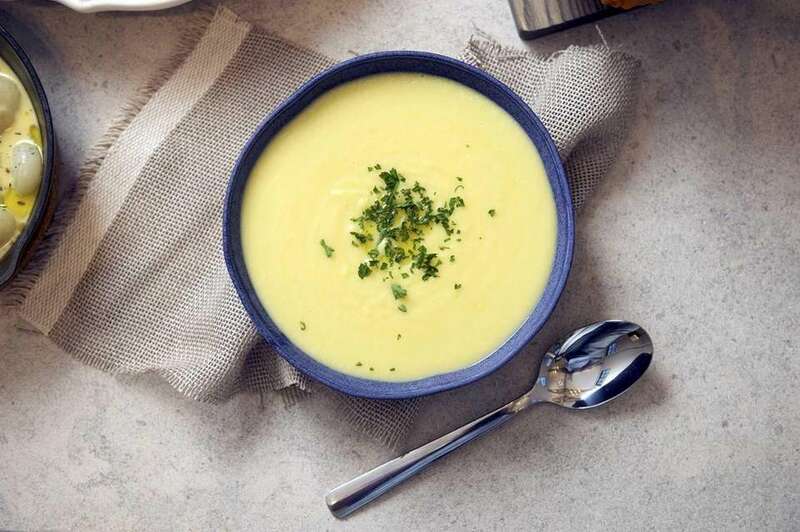 Ladle soup into bowls and garnish with a dollop of crème fraîche and some chili oil, if desired. Serve immediately. Makes 8 servings. 1. Julienne the radishes: Slice as thinly as possible (you can use a mandoline), then stack slices and cut into thin matchsticks. 2. In a small bowl, whisk oil into vinegar slowly so it emulsifies. Season with salt and pepper. 3. 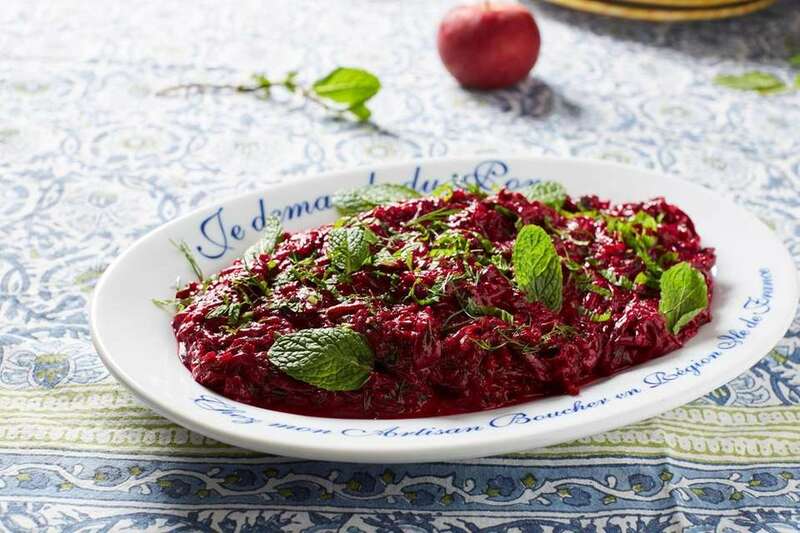 In a large bowl, combine radishes, greens and pomegranate seeds. Toss with dressing (start with about half and add as needed). Transfer to serving bowl and sprinkle with sesame seeds. Makes 8 to 10 servings. Note: To extract pomegranate seeds, cut the fruit in half through its equator (not through the flower end). Place a large bowl of water in the sink. Hold the halved pomegranate in one hand so that the cut half is down, facing your palm. Now, with your other hand, use a wooden spoon to whack the skin side of the pomegranate all over. The seeds will fall out into your hand, and then into the water. Keep whacking until all the seeds are out. The white pith will be floating on top of the water; the seeds will sink. Skim off the pith, then strain out the seeds. Many greengrocers also sell plastic containers of pomegranate seeds. 1. Preheat oven to 425 degrees. 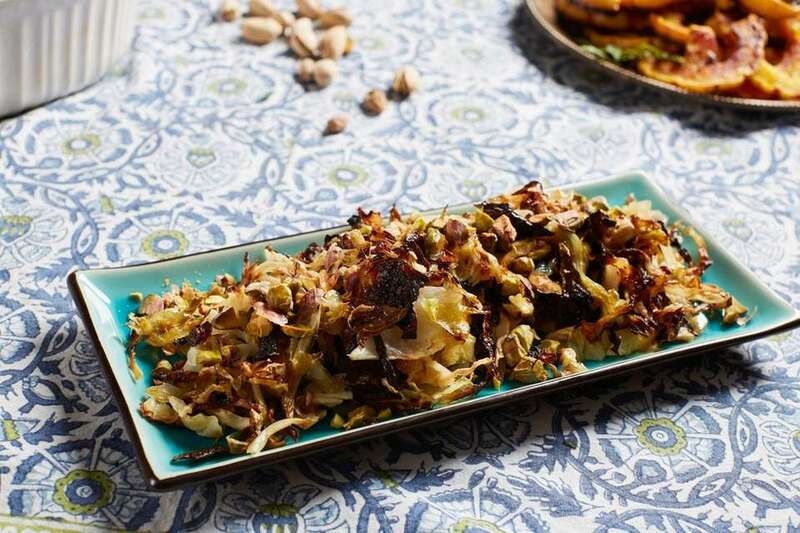 Place shredded cabbage in a roasting pan and toss with salt, pepper, fennel seeds and olive oil. 2. Cook for 30 to 45 minutes until lightly brown and crispy. Place on a platter, drizzle with lemon juice and finish with pistachios. Makes 6 to 8 servings. 1. Preheat the oven to 450 degrees and coat a baking sheet pan with cooking spray. 2. Toss the florets with the oil and spread on the prepared pan. Roast in the oven until lightly browned and fork tender, 20 minutes. 3. Combine flour and 1/4 cup of the milk, stirring until smooth. Whisk in remaining 1 1/2 cups of milk and set aside. Heat 1 tablespoon of butter in a saucepan over medium heat. Add onion and garlic and cook, stirring occasionally, until soft and golden, about 6 minutes. Add the milk-flour mixture, whisking frequently, and cook until the sauce is thicker than heavy cream, about 6 minutes. Remove from heat and stir in 1/2 cup of the cheese. Toss with the cauliflower and transfer to a 2-inch-deep baking dish. 4. Make the topping: Melt the remaining 2 tablespoons of butter. Combine in a bowl with the panko, remaining 1/4 cup of cheese, and thyme. Sprinkle over the cauliflower. Let the mixture cool, then cover with plastic wrap and store in the refrigerator for one day. To serve, place uncovered dish in a 350-degree oven until the topping is golden and the gratin warmed through, about 15 minutes. Makes 8 servings. 1. Make the sauce: In a large skillet, melt butter over medium-high heat. Add mushrooms and cook until a rich brown, about 5 minutes. Add shallots and garlic, and sauté until soft and fragrant. 2. Add flour and cook until it is golden, 3 to 4 minutes. Add vegetable stock and bring to a boil, scraping any browned bits from the bottom of the pan. Reduce until the flavor of the mushrooms intensifies, 15 to 20 minutes. Add cream and season to taste with salt and pepper. Set aside. 3. Prepare the green beans: Preheat oven to 350 degrees. Butter a 4-quart casserole dish. In a saute pan, heat olive oil over high heat. Sauté smashed garlic cloves for about a minute. Add green beans and sauté until they start to color, without cooking all the way through. In a bowl, combine green beans with mushroom sauce. Transfer mixture to the dish. Bake until mushroom sauce bubbles, about 30 minutes. 4. Fry the shallots: While the green beans bake, season the flour with salt and pepper. Toss the shallots with the seasoned flour. Heat about 1⁄2 inch vegetable oil in a skillet and fry the shallots until crisp. Transfer to a paper towel-lined plate to drain. 5. Remove the casserole from the oven, sprinkle with the fried shallots, and serve hot. Makes 8 servings. 1. Brown the butter by putting it into a small saucepan and heating over medium until it has a nutty aroma, turns a rich tan color and the milk solids, which will initially float to the top, fall to the bottom. Scrape up the solids and pour into a heatproof vessel. Set aside. 2. Unroll the round pancetta slices into strips and cut into 1/4-inch dice. Cook pancetta in a large skillet over medium-high heat, stirring occasionally, until fat starts to render and it begins to crisp, about 5 minutes. Transfer pancetta to a small strainer placed over a small bowl. 3. Heat olive oil in the same skillet over medium high and cook the garlic, stirring occasionally, until it is fragrant and golden, about 1 minute. Working in batches, add Brussels sprout leaves, tossing and letting them wilt slightly before adding more; season with salt and pepper. Cook, tossing occasionally, until leaves are browned in spots and the edges are crisp, about 8 to 10 minutes. Remove from heat and add the vinegar, pancetta, thyme and brown butter; toss to combine. Season with salt and pepper. Makes 8 servings. In a saucepan, combine water and sugar, stirring to dissolve; bring to boil. Add cranberries and orange zest, reduce to a simmer and continue to cook until the cranberries pop, about 10 minutes. Transfer to a bowl, let cool slightly, cover with plastic wrap and refrigerate until cold. Makes 8 servings. 1. Preheat oven to 375 degrees. In a large bowl, toss squash and sweet potatoes with olive oil, coriander, cinnamon, salt and pepper. Place ingredients on 1 or 2 baking sheets (lined with parchment or a nonstick mat) and bake until soft and golden, about an hour. 2. Meanwhile, combine maple syrup and butter in a small saucepan over low heat until butter melts. When vegetables are done, transfer to large bowl, pour maple-butter mixture over them and roughly smash with a large spoon. Taste for salt and pepper. Heap into ovenproof serving dish and keep warm. Just before serving, sprinkle on walnut-lemon topping. Makes 8 to 10 servings. 1. Preheat oven to 350 degrees. Spread walnuts on baking sheet and toast until fragrant and lightly colored, about 8 minutes. 2. Meanwhile, put 3/4 cup sugar and pinch of salt in a heavy, light-colored saucepan. Cook over medium heat and when sugar starts to melt, stir with a wooden spoon. Once sugar melts, it will begin to color quickly. 3. When the melted sugar is medium amber, take pan off heat, add walnuts and stir quickly to coat each nut. Turn nuts out onto a parchment-lined baking sheet and try to spread them out into 1 layer. When cool, roughly chop to break nuts up. Makes 2 cups. 4. Toss lemon zest with 1 tablespoon sugar. Spread on parchment-lined cookie sheet and bake in a 350-degree oven until sugar melts and zest turns lightly golden, about 10 minutes. Cool. Makes about 2 tablespoons. 1. Preheat oven to 375 degrees. Spread 1 cup of salt in an ovenproof skillet or baking dish. Place beets on the salt and cover with 4 cups salt. Bake until the beets are tender, about 90 minutes. While the beets are cooking, make tahini sauce. 2. When beets are cool enough to handle, remove from the salt and peel. Set aside to cool completely. 3. Grate the beets into a mixing bowl using the coarse holes of a box grater. Add the tahini sauce, oil, lemon juice, dill and mint. Season with the remaining 1⁄2 teaspoon salt. Mix well. 4. Top with more chopped dill and mint, and serve. Makes 6 to 8 servings. 1. Break up the bulb of garlic with your hands, letting the unpeeled cloves fall into a blender. Add the lemon juice and 1⁄2 teaspoon of the salt. Blend on high for a few seconds, until you have a coarse puree. Let stand for 10 minutes to mellow. 2. Pour the mixture through a fine-mesh strainer set over a large mixing bowl, pressing on the solids to extract as much liquid as possible. Discard the solids. Add the tahina to the strained liquid, along with the cumin and 1 teaspoon of the salt. 3. Whisk the mixture together until smooth (or use a food processor), adding ice water, a few tablespoons at a time, to thin it out. The sauce will lighten in color as you whisk. When the tahini seizes up or tightens, keep adding ice water, bit by bit (about 1 1⁄2 cups in all), whisking energetically until you have a perfectly smooth, creamy, thick sauce. 4. Taste and add up to 1 1⁄2 teaspoons salt and cumin, if you like. If you're not using the sauce immediately, whisk in a few tablespoons of ice water to loosen it before refrigerating. The tahini sauce will keep a week refrigerated, or it can be frozen for up to a month. Makes about 4 cups. 1. Preheat oven to 400 degrees. Toss sprouts in a bowl with the olive oil, 3/4 teaspoon salt, 1/2 teaspoon pepper. Pour onto a sheet pan and roast for 35 to 40 minutes, until browned and crisp on the outside and tender on the inside. Shake the pan from time to time to brown the sprouts evenly. 2. In saute pan over medium heat, cook the bacon to render some of the fat, about 5 minutes. Add the onion and continue to cook, stirring frequently, until onion is golden brown, about 20 minutes. 3. 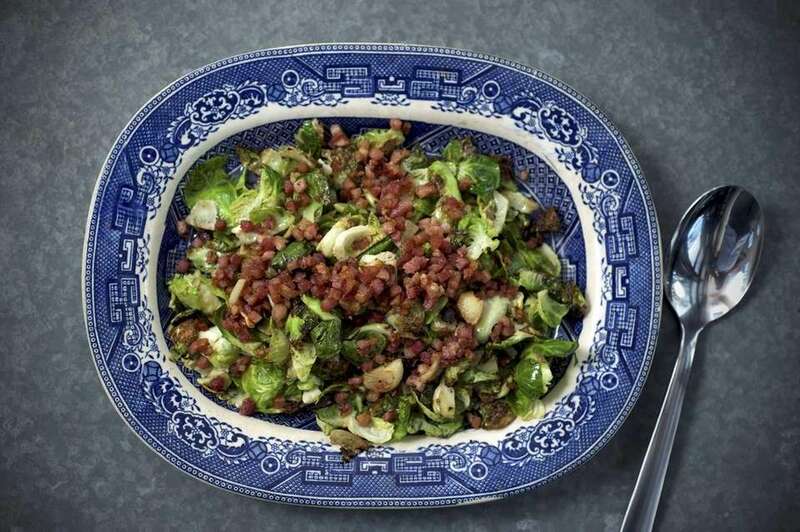 When sprouts are cooked, drain excess fat from bacon and onion and combine with sprouts in a mixing bowl. Sprinkle with more kosher salt and pepper, if necessary. Makes 8 servings. 1. Combine the cranberries, maple syrup, cinnamon and orange juice in a 3-quart saucepan and bring to a boil over medium-high heat. Reduce the heat to medium low and simmer, stirring occasionally, just until the cranberries burst, about 5 minutes. 2. Remove from the heat, stir in the zest and let it cool to room temperature, about 1 hour. The sauce will thicken as it cools. Leave the cinnamon stick in it. Makes 8 to 10 servings. TIP: When you toast the cinnamon stick over your gas burner, use tongs. If you have an electric range, you can forego the toasting. 1. 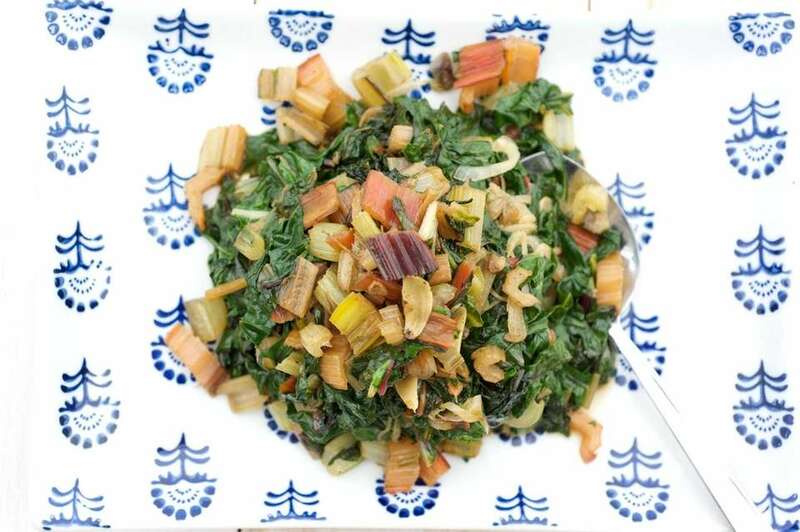 Trim off ends of chard stems. Tear away leaves from stems. Line up stems and cut into 2-inch segments. Pile leaves on top of one another and cut crosswise into 1-inch strips. 2. In a large saucepan over medium heat, melt 1 tablespoon butter. Add shallots and garlic and cook gently to soften but not brown, about 5 minutes. Add stems to pan, add a little salt and pepper, and saute about 5 minutes. 3. Add leaves, turn up heat and cook, moving the leaves around almost constantly, until they wilt and become tender, about 5 minutes longer. Adjust seasoning and stir in remaining butter. Makes 8 servings. Za'atar is a traditional Middle Eastern blend of dried herbs and sesame seeds. Look for it in the spice aisle of the supermarket or Middle Eastern food stores. 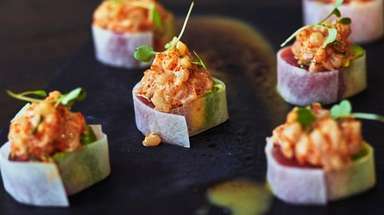 Or make your own by combining 1/2 cup sesame seeds, 1/4 cup dried sumac, 2 tablespoons dried thyme, 1 teaspoon dried oregano and 1 teaspoon dried marjoram in the workbowl of a food processor and pulsing once or twice to coarsely grind the sesame seeds. Keep it in an airtight container with the rest of your spices in a cool, dry pantry. 1. Bring a large pot of salted water to boil. Add green beans and cook until just tender, about 4 minutes. Drain and return to pot, stirring for 30 seconds or so over medium heat to evaporate any excess water. 2. Stir in olive oil and za'atar until fragrant, another minute. Transfer to a serving bowl, season with salt and serve immediately or cover and refrigerate for up to 24 hours and let come to room temperature before serving. Makes 8 servings. 1. Preheat oven to 400 degrees. 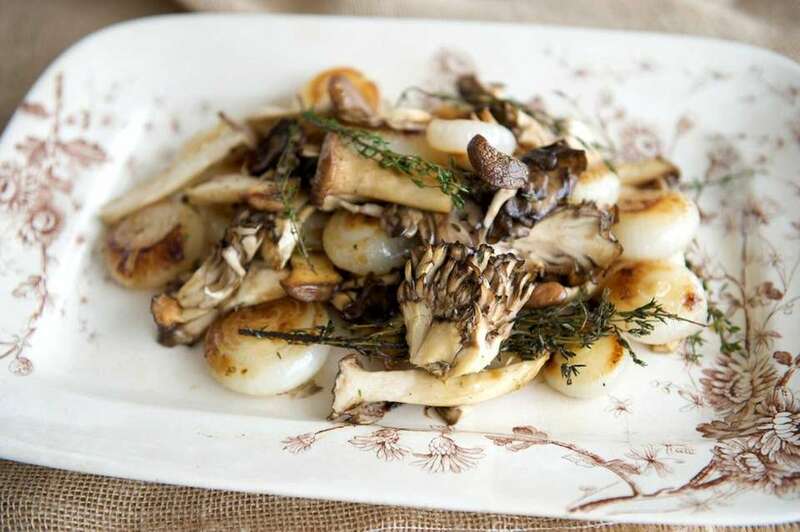 Toss mushrooms with olive oil, salt and pepper, place on baking sheet and cook until they are fragrant and start to brown, about 15 minutes. 2. In a large skillet, melt butter. Add onions and thyme sprigs to pan, season with salt and pepper and cook, over medium heat, until onions are nicely browned, 20 to 30 minutes, depending on size. Stir onions frequently and turn occasionally. 3. Combine roasted mushrooms and browned onions. Adjust seasoning. Makes 8 servings. 1. In a saucepan, combine cream with garlic, thyme, bay leaf, nutmeg, salt and pepper and rind, if using. Simmer over medium heat until cream is reduced by about half, 20 minutes. Pick out thyme and bay leaf but, if desired, mash garlic into cream. 2. Bring a large pot of salted water to boil. Working in batches, immerse spinach in boiling water for about a minute, then remove and immerse immediately in a bath of ice water. (A clean kitchen sink is good for this operation.) Strain spinach and squeeze out as much liquid as you can so that you're left with a dense ball of spinach. Place on cutting board and roughly chop. 3. Preheat oven to 350 degrees. In a large bowl, combine spinach with reduced garlic cream. Add a cup of Parmesan and taste for salt and pepper. Turn spinach into baking dish, cover pan with foil and bake until heated, about 30 minutes. (Or refrigerate for up to 24 hours. Bring to room temperature before baking, or increase baking time.) Remove foil, sprinkle with remaining cheese and continue to bake until it just begins to brown, 10 to 15 minutes. Makes 8 to 10 servings. 1. Preheat oven to 375 degrees. Lightly butter an 11-inch-by-7-inch baking dish. Combine the leek, butter and 1/4 cup water in a large saute pan and heat over a medium flame. Simmer until leek is soft, about 5 minutes. Set aside. 2. In a large bowl, mix together the cream, milk, rosemary and garlic. Season generously with salt and pepper, add the potato slices to the bowl and mix well. In the buttered dish, layer one third of the potato slices, shingling them over one another. Top with half the goat cheese and half of the leeks. Shingle another layer of potatoes, top with goat cheese and leeks and then the final layer of potatoes. Pour any cream mixture remaining in the bowl over the potatoes, so that they are submerged. Cover with foil. 3. Bake for 45 minutes, remove foil and bake for an additional 15 minutes until it is golden and bubbling. Let rest for 30 minutes. Makes 8 to 12 servings. 1. Tear off any bruised or discolored outer leaves and with a sharp knife, trim the bases of the sprouts and, with a sharp knife, carve a shallow "X" into them. 2. Bring a large pot of well-salted water to boil and blanch the Brussels sprouts just until tender, about 4 minutes. Strain and transfer immediately to ice water to stop the cooking. Drain and set aside. When cool, cut each sprout in half through its base. 3. Cook the bacon in a large saute pan over a low flame until the fat renders out, about 15 to 20 minutes. Remove from the pan, leaving behind the rendered fat, and drain on paper towels. 4. Turn heat to medium high and when fat is hot, add the Brussels sprouts, cut side down. Once you've added them to the pan, don't touch the sprouts for at least 3 minutes. They will need up to 10 minutes to brown properly. When the bottoms are a nice golden brown, remove sprouts from the pan and set aside. 5. Turn heat down to medium, add shallots to the pan and cook until caramelized, about 10 minutes. Add the bacon and Brussels sprouts back to the pan and toss well. Taste for salt and pepper. Cook for an additional three minutes and serve immediately. Makes 8 servings. Chinese five-spice is a blend of five Thanksgiving-friendly flavors: Cinnamon, star anise, black pepper, cloves and ginger. 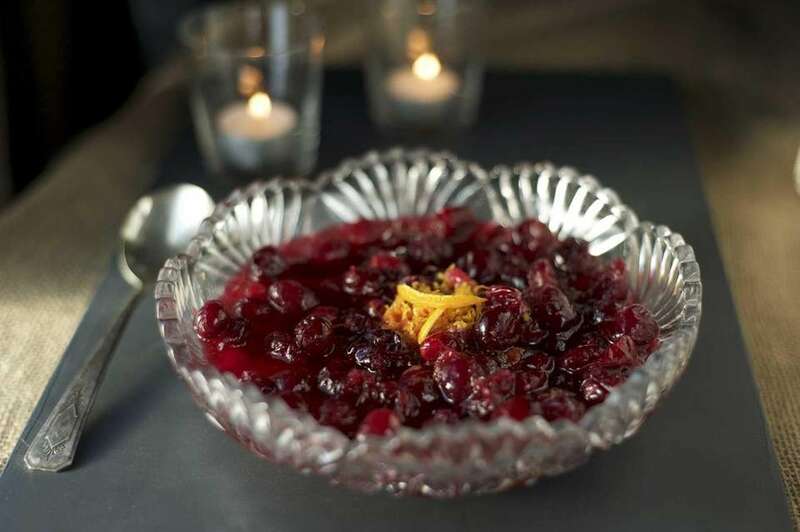 It is a simple way to add spice to traditional cranberry sauce. 1. Combine cranberries, sugar and water in a heavy pot. 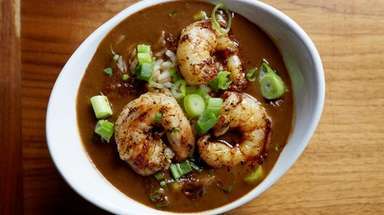 Bring to a boil over medium-high heat, reduce to a simmer, and stir in five-spice powder and salt. 2. Continue to simmer until most but not all of cranberries have burst, about 5 minutes. Stir in zest and juice, remove from heat, and let cool. 3. Refrigerate in an airtight container until cold, at least 5 hours and up to 3 days. Makes about 2 1/2 cups. Steps 1 and 2 may be done ahead. Just before serving, proceed with step 3. 1. Whisk together 1 tablespoon of the oil, the lemon juice and salt and set aside. 2. Heat the remaining 1 tablespoon of oil in a large nonstick skillet over medium high. Add the garlic and cook, stirring, 30 seconds. Add the zucchini and celery and cook, stirring often, until the vegetables are somewhat softened (but not cooked through), about 4 minutes. 3. Add the sugar snaps and cook 1 to 2 minutes until bright green; add the snow peas and cook 1 to 2 minutes until bright green. Remove from heat, toss with the dressing and serve. Makes 8 servings. Combine broth, honey, butter, and salt and pepper to taste in a saucepan. Bring to boil, add turnips and simmer for 15 minutes or until tender. Drain and set aside. 1. Place the whole head, cream and a small pinch of salt in a heavy, lidded saucepan. Simmer over a low heat until cauliflower is fork tender, about 30 minutes. 2. Remove the cauliflower from the cream and, in a blender, puree with the truffle oil and truffle butter. Set aside. 1. Dry the scallops on paper towels and season well with salt and pepper. Dust lightly with Wondra flour. 2. 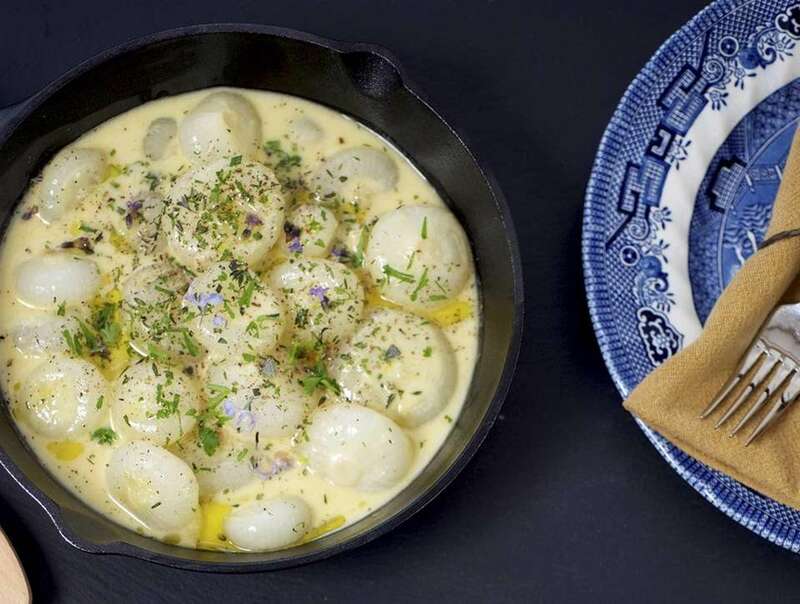 Pour olive oil into a saute pan, preferably nonstick, that is large enough to accommodate all the scallops in one layer - otherwise use two pans. Heat pan on high, and when oil is lightly smoking, add the scallops to the oil and do not touch them for at least 1 minute. When the bottoms of the scallops are golden brown, shake the pan to loosen them and add shallots and garlic. When they begin to sizzle, add wine, truffle butter, chives and lemon juice and the cooked turnips. Cook everything together, shaking the pan gently to mix. 3. Divide cauliflower mousse among 8 serving plates. Use the back of a spoon to spread it into a low, even bed. Spoon scallops and turnips over the mousse and, if using, shave truffle over everything. Makes 8 servings. 1. 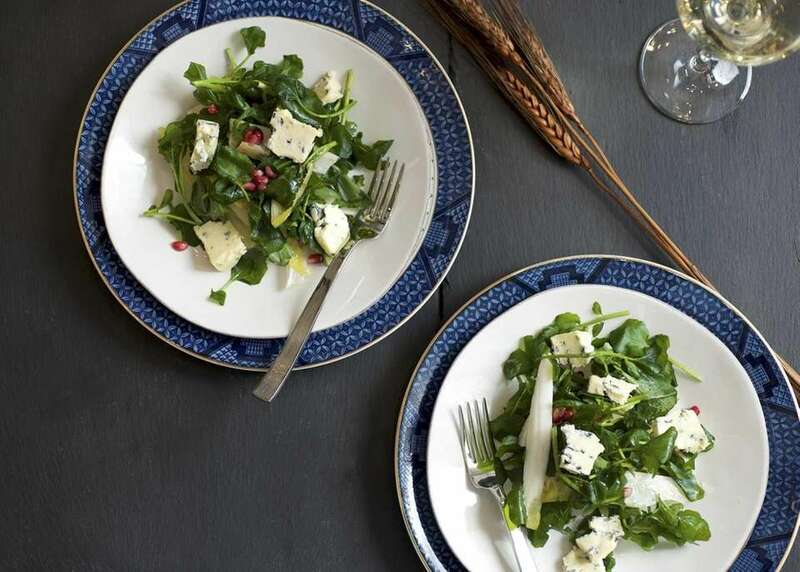 Combine the pomegranate seeds, watercress, endive, Cabrales and parsley in a large bowl. 2. Whisk together the vinegar, salt, pepper and olive oil. Toss with the salad, and serve. Makes 8 servings. NOTE: To extract pomegranate seeds, cut the fruit in half through its equator. Place a large bowl of water in the sink. Hold the halved pomegranate in one hand so that the cut half is down, facing your palm. With your other hand, use a wooden spoon to whack the skin side of the pomegranate all over. The seeds will fall out into your hand, and then into the water. Keep whacking until all the seeds are out. The white pith will be floating on top of the water; the seeds will sink. Skim off the pith, then strain out the seeds. Many greengrocers also sell plastic containers of pomegranate seeds. 1. Preheat oven to 450 degrees. Coat a baking sheet pan with cooking spray. 2. Cut squash in half lengthwise and scoop out seeds. Cut across into 1/2-inch slices and combine in bowl with olive oil. Add coriander, cumin, thyme, ginger, salt and cayenne and toss thoroughly. Place in a single layer on baking sheet and roast, turning once halfway through cooking, for a total of 24 minutes, until squash is lightly browned and tender. Makes 6 servings. Gremolata is an Italian condiment composed of olive oil, minced garlic, parsley and lemon peel. Here it elevates simple steamed cauliflower. 1. On a cutting board, combine parsley, lemon zest and garlic and, with a chef's knife, mince them all together to almost form a paste. Scrape into a bowl, season with salt and pepper and stir in enough olive oil to make a thick sauce. 2. Trim bases of cauliflower heads and break up into florets. Steam over boiling water until tender, about 5 minutes. Toss with gremolata and serve. 1. Preheat the oven to 450 degrees. Place the potatoes on a baking sheet and bake about 40 minutes or until tender. Remove them from the oven and let cool slightly. Peel the potatoes and then, using a potato ricer, rice them into a mixing bowl. 2. In a sauce pan, heat the butter and milk until the butter is mostly melted and the milk is steaming. Keep stirring the mixture into the riced potatoes until the mixture is fully combined. (For creamier potatoes, you can work them through a metal strainer or sieve, or place them in the bowl of a standing mixer with the paddle attachment and beat them on medium speed until creamy.) Season to taste with salt and top with snipped chives. Makes 8 servings. Combine all the ingredients in a large saute pan and pour in enough water to cover. Heat over medium-low heat, then simmer until the water has evaporated and the onions are nicely glazed and shiny, about 25 minutes. 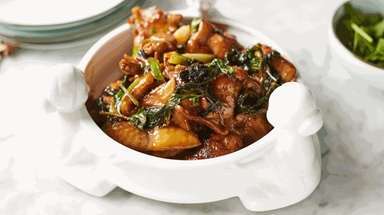 Toward the end of cooking, monitor the pan carefully because the honey in the sauce can burn. Taste and adjust seasoning before serving. Makes 8 servings. 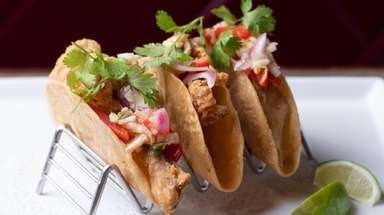 Creative turkey recipes for ThanksgivingIf you're tired of serving a typical turkey, try spicing up your Thanksgiving feast with one of these creative recipes. 16 delicious desserts for ThanksgivingEven after a huge Thanksgiving dinner, there's always room for dessert. 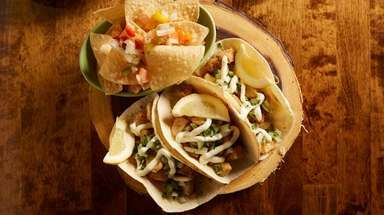 Here are some tasty treats to cap off your holiday feast. 10 stuffing recipes to try this ThanksgivingThese simple stuffing recipes are sure to impress this Thanksgiving.